Want to bring out the child in you? Why not get this name necklace to furnish your wardrobe and complete your outfit? Made from sterling silver, the name necklace will typically contain the name of your choice written in the font that you use. There is a wide array of fonts to choose from, and it is this variety that makes the necklace a personalised piece of jewellery. 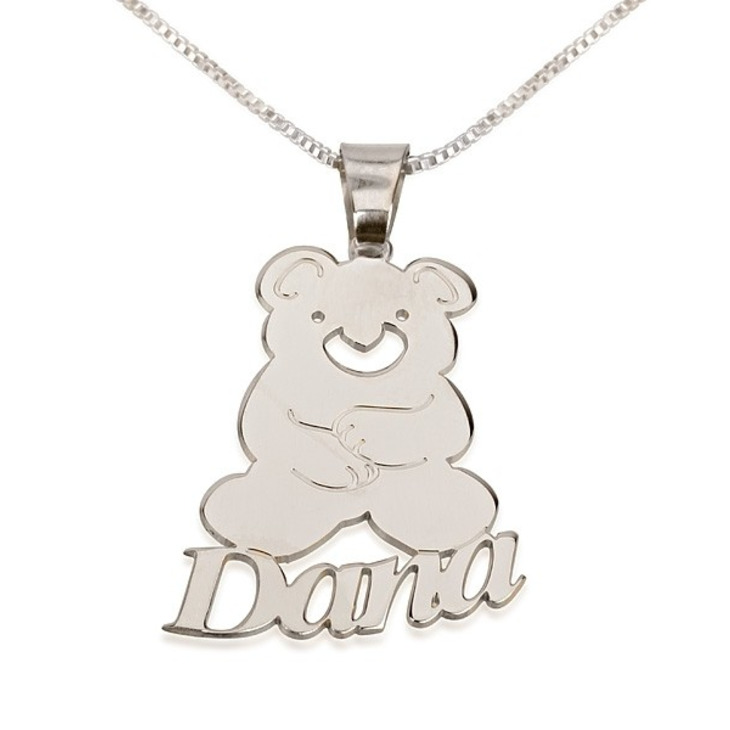 The special thing about this particular name necklace is the inclusion of a teddy bear on the letters. The position of the teddy is usually at the centre of the name, although there are instances where the client prefers the teddy to be at either sides of the necklace. Whichever the placement, it is important to create a balance so that the addition of the teddy bear does not appear to weigh the wearer down. You could also get this necklace for your child or for your favourite niece on their birthday. 34mm x 48mm / 1.3" x 1.9"